Note about the author: An Under Sheriff of Washoe County, Nevada, Kinkead arrested two of the bank robbers. His narrative of the ‘First Train Robbery On The Pacific Coast‘ first appeared in the Third Biennial Report of the Nevada Historical Society, 1913, Carson City, Nevada. On the morning of November 5, 1870, news was flashed around the civilized world that the Overland Express train which had left San Francisco the previous morning, carrying the gold to the miners at Virginia City, had been “held up” and robbed near Verdi, a station about ten miles west of Reno, and that over $40,000 had been taken from the Wells-Fargo strong box by masked men heavily armed. 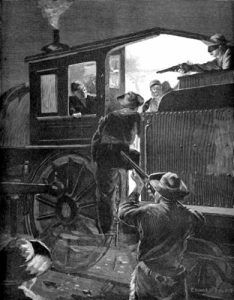 This being the first train robbery on the Pacific Coast, it almost took away the public breath, and for a while caused great excitement and much newspaper comment on two continents. Every enemy of law and order was quick to voice praise of the boldness and nerve of the perpetrators of the robbery, and Nevada acquired the dubious credit of being one of the first States in the Union that could produce a set of outlaws daring enough to stop and rob an express train. Immediately, large rewards were offered by the authorities of Washoe County, by the State of Nevada, the Central Pacific Railroad, and by the Wells-Fargo Express Company, for the apprehension of the robbers, aggregating $30,000. It is needless to say that many men were working on the case in a few hours. The hold-up occurred in this manner: Just as the train pulled out of the Verdi station it was boarded by five masked men. Two of them climbed into the cab of the engine and covered the engineer and the fireman with six-shooters. The engine was surrendered at once. Another boarded the front platform of the express car, while two others took possession of the rear platform. After the train had proceeded about half a mile east of Verdi, the men on the engine ordered the engineer to whistle “down brakes.” This was before the days of air-brakes and one short blast of the whistle brought the brakemen to the platforms, where they began the work of setting the brakes. This was also a signal to the three men on the express car to cut the bell-rope and pull the coupling pin at the rear of the car. As soon as this was done the engineer was ordered to “give her steam,” which he did at once, and when Conductor Marshall went forward to ascertain what had caused the stoppage of the train, he discovered he had lost his engine, mail car, and express car. The robbers then sped down the grade with this part of the train, leaving the other cars at a standstill. The engineer, realizing what was being done, at first refused to pull out, but the muzzle of a pistol against his temple caused him to obey orders. The fireman was nearly frightened out of his senses and did not have to be told more than once to do anything. At a point four or five miles west of Reno the engine came to a halt because of an obstruction on the track, placed there by a confederate of the robbers. They had figured that the engineer might run past the place designated for the hold-up or might play them some trick by opening the throttle and jumping from the engine. After the engine was stopped there was a knock at the door of the express car, and Frank Minchell, the messenger, called out, “Who’s there”? and the reply was, “Marshall.” The messenger then opened the door and, instead of seeing Conductor Marshall as he expected, was confronted by the muzzle of a double-barreled sawed-off shotgun. He was taken completely by surprise and surrendered without any fight. After telling him to sit down in the corner of the car and keep quiet, the robbers threw the Wells-Fargo sacks of gold, containing $41,000, through the side door of the car into the brush, thanked the messenger for giving them so little trouble, adding that they were glad they did not have to kill him, shouldered their booty and disappeared into the darkness. Meanwhile Conductor Marshall was allowing his headless passenger train to drop slowly down the grade, anticipating danger of an unknown character, but boldly facing it. When his train arrived at the scene of the robbery he found that the work of the robbers was finished and the engineer and fireman were busy removing the obstructions from the track. The train was then “made up” and continued on its way, reaching Reno thirty minutes after midnight, only thirty minutes late. 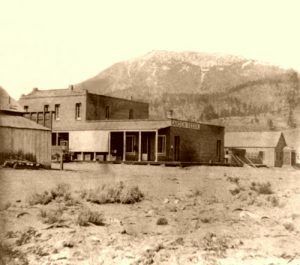 The Sheriff, Charley Pegg, and his under sheriff immediately saddled up and struck for the mountains by a short cut, assuming that the robbers would take the Truckee route between Truckee, Carson City, and Virginia City. Thus they expected to head off the robbers. After striking the trail the officers followed it northerly for a few miles and then returned to Washoe City, for they were convinced that no one had passed over the trail since a light fall of snow a week before. The message from Pendergast proved to be misleading, since the robbery occurred below Verdi instead of above it, and the officers lost the first day. They were just in time, however, to catch Dwyer’s stage to Reno at 9 o’clock that night. The Deputy Sheriff took passage on this stage, and upon reaching Reno learned that the Wells-Fargo detectives and some of the railroad and Reno officials, together with a posse of citizens from Reno, had been out all day on a “sure clue” which afterwards proved to be a false one. Early the next morning the Washoe County officer with a fresh horse went to the scene of the robbery, and after carefully examining the ground discovered one footprint which was easily distinguished from the others. It was made by a boot having a very small heel, such as the dudes and the gamblers wore in those days and our wives and daughters wear now. No laboring man or railroad employee ever wore that boot, and it was too soon after the robbery for the curious to have visited the ground, so the officer in charge of the party knew that if he could find that track and follow it after it left the scene of the robbery he would be sure to land at least one of the robbers.